In recent years, there has been increasing evidence that exposure to pesticides during critical developmental windows can have a negative impact on normal brain development. As insecticides such as endosulfan are broadly used, highly lipophilic and accumulate in the environment, risks of potential exposure and any related health effects present a hazard to human health as evidenced in both epidemiologic and laboratory findings. 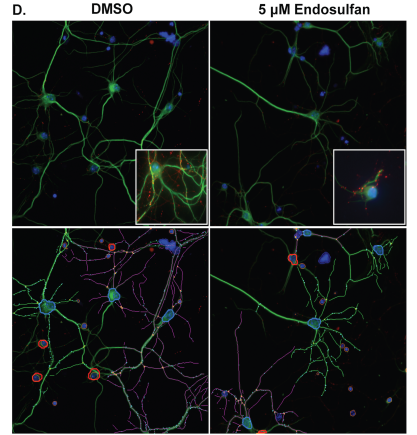 Researchers examined the impact of an organochlorine insecticide, endosulfan, on neurodevelopment, assessing the specific neuronal circuitry that may be affected. Through this study, researchers found that endosulfan exposure of female mice during pregnancy and lactation resulted in significant changes to neurotransmitter systems (GABAergic, glutamatergic and dopaminergic) in the frontal cortex of their male offspring. As these systems are all involved in conditions such as cognitive deficits, autism spectrum disorder and schizophrenia, the study identifies a potential risk factor underlying their development.